Blue-eyed grass (Sisyrinchium bellum) - a small native Iris. Mother Nature's Backyard, Gardena CA. Much can be said for garden bulbs. They come up year after year, a welcome spot of color in the spring or summer garden. They spread and naturalize, turning a small initial investment into something spectacular (if you’re patient). Many bulbs are relatively easy to grow. And there’s something enchanting about a perennial that dies back to the ground, then re-appears, as if by magic, in the spring. Many California gardeners don’t realize that California is home to over 200 species of native bulbs, corms and rhizomatous perennials. While many native bulbs can be found in coastal areas and in the mountains and foothills, most parts of California – even the deserts – are home to at least a few species. Happily, more species are showing up in local gardens each year. The perennials known as ‘garden bulbs’ actually belong to three different groups: those with true bulbs, those from corms and those from reproductive rhizomes. 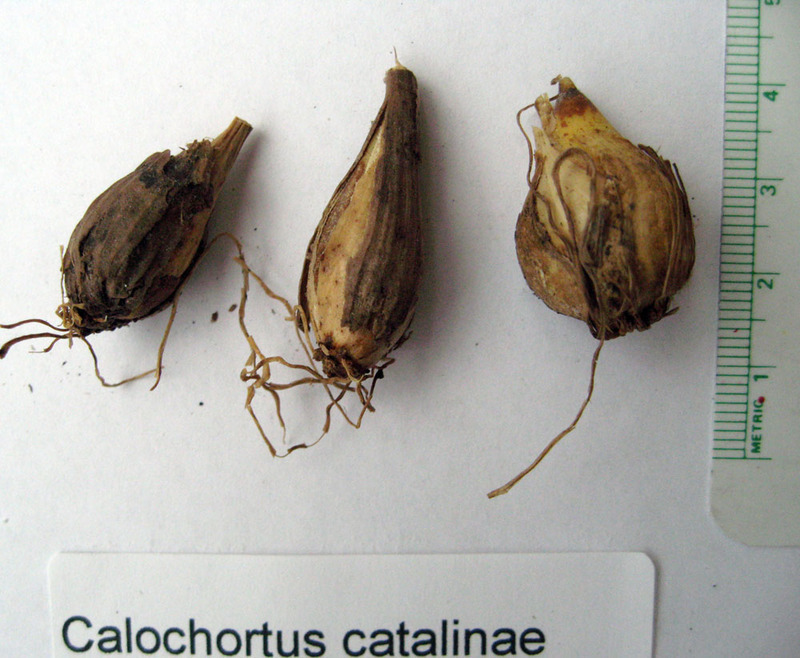 True bulbs are short, underground stems, complete with fleshy leaf scales and an embryonic plant. The energy for next year’s growth is stored in the leaf scales; the plant survives harsh environmental conditions (cold and/or dry) in a dormant state. Onions are a good example of true bulbs. The rings you see when you cut an onion are the leaf scales; the embryonic plant is in the center. True bulbs die back to the same bulb each year. They reproduce by seed and by producing offsets (bulblets or bulbils) that are usually clustered at the base of the mother bulb. True bulbs are among the most beloved garden treasures; some – like the onions - are also important edibles. Common examples of plants from true bulbs are Amaryllis, Narcissus/Daffodil, Allium (Onions), Lily and Tulip. Additional genera from California include: Calochortus (mariposa lily), Camassia (camas lily), Chlorogalum (soap lily) and Fritillaria (fritillary). Perennials from corms also store energy in an underground stem base during the dormant season. But you won’t find any rings when you cut open a corm – they’re solid! The corm is truly a food storage device, and corm-forming perennials produce a new one each year – one on top of the other. You will sometimes see the remnants of many old, used-up corms on an old plant. Like the true bulbs, corm-forming perennials reproduce both by seed and by producing offsets, called ‘cormels’ (tiny corms). Many plants from corms are popular garden perennials. Among the better known are the so-called ‘Autumn Bulbs’: Gladiolus, Crocus, Crocosmia, Colchicum, Freesia and Watsonia. Several important food plants – including plantain/banana and taro – are corms. 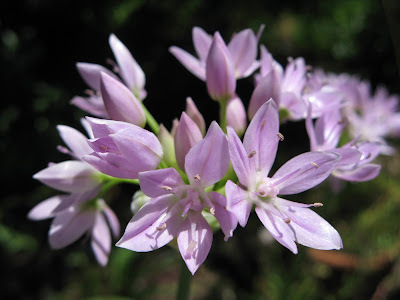 California is home to additional corm-producing genera including Bloomeria (goldenstar), Brodiaea, Dichelostema (wild hyacinth), Erythronium (fawn lily), Odontostomum (doll lily) and Triteleia. True bulbs and corms can be kept cool and dry, then shipped dormant to your door. Not so the plants from reproductive rhizomes. These are almost always purchased as young plants, since the actual rhizomes have a short shelf-life. Rhizomes are horizontal, underground stems; the reproductive/dormancy types are thickened for food storage. A good example is the Bearded Iris. The Douglas iris (sometimes called ‘Pacifica Iris’) and the Sisyrinchium species (Blue-eyed grass; Yellow-eyed grass) and Epipactis (stream orchids) are good examples of natives from rhizomes. When do native bulbs, corms and rhizomes bloom? 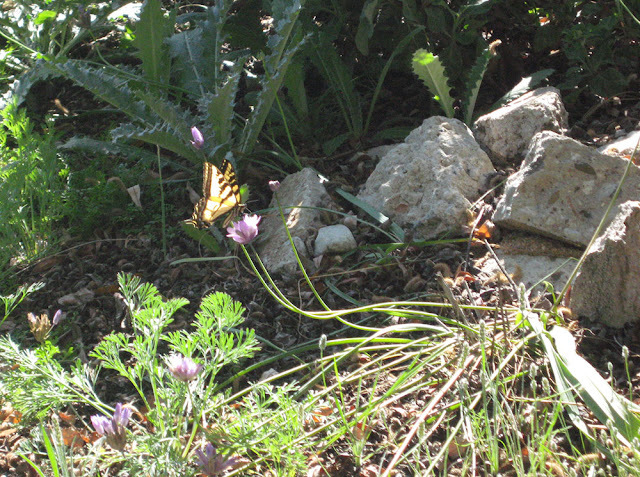 Because we live in a mediterranean climate, many California species bloom in spring or early summer. That allows them to bloom, set seeds and store energy before the long dry season commences in earnest. But there are some ‘bulb’ species that bloom very early (February) and other which are later (July or even later). In general, those from Northern California and from higher elevations tend to bloom later than those native to the S. California lowlands and deserts. Garden bulbs begin to grow, flower and set seeds partly in reaction to environmental cues. California species often begin growing when the ground becomes moist in winter or early spring. Others need warmer temperatures, or a certain length of cold exposure, to commence growing or flowering. Because environmental conditions vary from year to year, the timing of bloom can only be approximate. Additional factors which may influence timing in individual gardens are sun exposure and whether plants are grown in pots or in the ground. 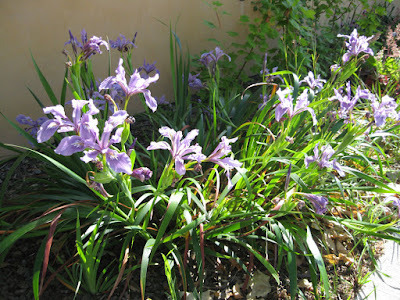 But here are some rules of thumb for common native bulbs, corms and rhizomes in lower elevation S. California gardens. When should I plant native garden bulbs? Early winter – plant bulbs/corms; plant out rhizomatous plants. Winter/spring – many native ‘bulbs’ emerge, grow and flower. Give dose of ½ strength fertilizer to bulbs grown in pots in winter. Spring/summer – many native ‘bulbs’ set seed; foliage dies back. Begin to withhold water as foliage dies back or flowering commences (whichever comes first). Collect or scatter dry seeds. Cut back dry flower stalks; let leaves remain attached if possible. Many California native bulbs and corms do well in pots. Can I grow native garden bulbs in pots? Yes, in fact that’s a good way to use native ‘bulbs’ to best advantage. Pots can be ‘retired for the season’ during the dormant period. And pots are one of the best ways to multiply rare bulbs and corms, prior to planting out in the garden. The best containers for native bulbs are at least 8 inches deep and 12 inches in diameter. This will allow space for bulbs to increase for 3-4 years without replanting. We prefer unglazed clay pots, but most pots will do, as long as bulbs can be summer dry. One way to feature bulbs for seasonal color is to use the old cache pot trick; plant the bulbs in an inner pot, which can then be removed and replaced as the season requires. We let our potted bulbs bloom and set seed, collect the seed (or scatter in the pot), then move the pot to a cool, dry place until late fall. At that time we add a layer of fresh potting soil, expose the pots to the winter rains, and away we go. There’s no need to remove the bulbs from the pot each year. Do I need to dig up native garden bulbs each year? No. The reliable ‘bulbs’ (recommend below) do fine (in a pot or in the ground) for at least 3-4 years without digging them up. If flowers become less profuse – or pots appear crowded – then you will need to dig up ‘bulbs’ and replant. This is often more of an issue with pot-grown plants – but those in the ground may also become over-crowded. Native Californians harvested most of the edible bulbs and corms every third year, keeping wild resources productive. That’s a good rule of thumb for the home gardener as well. Pot-grown bulbs and corms can be dug up anytime from late summer through fall. We just dump the whole pot out, then sift through the potting soil to find ‘bulbs’ of all sizes. We repot the largest in fresh potting soil and pot up the smaller ones in new pots (you can place the smaller ones about ½ inch apart). If growing the rhizomatous species, divide the rhizomes as you would a bearded Iris. You don’t need to be too gentle - just be sure that there’s a new shoot on each piece. Smaller bulbs and corms may take several years to get to a size where they will bloom. Divided rhizomes usually bloom the first or second year. Bulbs, corms and rhizomes grown in the ground are a bit more of a challenge. If the dry ground is hard, you may have to wait for the first good rain to soften the soil. Then get out, dig up and replant the ‘bulbs’ to give them room to thrive. What’s the trick to watering native garden bulbs? Like all perennials, native bulbs, corms and rhizomes need adequate winter and spring moisture. If we have a dry winter/spring, you’ll need to supplement after the ‘bulbs’ begin to grow and until either: 1) the leaves start to yellow, or; 2) flowering commences. After that, plants need less water. Taper off water as the plants flower, the flowers wilt and the seeds develop. Being from a mediterranean climate, most California native bulbs, corms and rhizomes need a dry, dormant period from summer through fall. That being said, plants from climates that get a little summer rain – or grow near lakes and streams - are more tolerant of summer water than those from summer-dry Southern California. Native ‘bulbs’ from Northern California, as well as those that experience summer monsoons (including those from the Sonoran desert, Southern San Diego County and the local mountains) will accept occasional summer water. Emphasis is on ‘occasional’ – native bulbs need a dry period and are susceptible to rotting if over-watered. The best strategy is to either plant the more tolerant species – or plant local species in areas that can be kept summer dry (or nearly so). If you don’t have a summer-dry area, grow the natives in a pot. Ripe seed ready for scattering or collecting. Blue-eyed grass (Sisyrinchium bellum) from seed. Can I grow native garden bulbs from seed? Yes. In fact many are easy to grow from fresh seed. If you want to naturalize, just scatter seeds in the garden (or into the pot with the bulbs) and they’ll take care of themselves. You can also collect the dry seeds, store in a cool dry place (we put them in envelopes in a cool room), and plant them in the late fall. Stored seeds can be started in pots in late fall or winter. Nearly fill a pot with potting medium (not garden soil), scatter fresh seeds in the prepared pot, cover lightly with a little extra potting soil, water in and place in a place where pots are watered by rains. A partly shady place is best and you may need to supplement the rains. Tiny seedlings look like grass (see above) and are very susceptible to drying out. If using purchased seed (or seeds from colder climates) you may need to pre-treat the seeds in S. California. Follow the grower’s directions or give the seeds 4-6 weeks cool moist treatment (we use a moist coffee filter, in an open plastic bag in the refrigerator). We let our pots of small seedlings slowly dry out mid-spring, place pots in a cool dry place for summer/fall, then bring them out again in winter. It will take plants grown from seed 3-4 years to reach flowering size. We recommend repotting the bulbs in the fall after the third growing season. In Mother Nature's Backyard we let bulbs naturalize from seed. Do I need to dig or amend the soil prior to planting native garden bulbs? Nope. If planting them in the ground, all you need is a hole as wide as the bulb and 3 times as deep (or at least 3 inches). The reliable native bulbs don’t need lots of amendments or babying – that’s one of the joys of gardening with them. If growing the native bulbs in pots, just add a layer (1-2 inches) of fresh potting soil to the top of the pot each fall, unless you’re dividing and replanting. If replanting, start out with fresh potting soil. Where can I purchase native garden bulbs? What species do you recommend for the beginning bulb gardener? Some native bulbs, corms and rhizomes are easier to grow than others. We recommend the easy species to the beginning gardener. They are also the ones we rely on for dependable color, year after year, in our own gardens. Here are our recommendations for lower elevation S. California gardens. Wow, you guys constantly amaze me with your in-depth articles and good advice. This one on bulbs is a treasure. I've found Alliums the easiest to grow in home garden conditions. Not from seed - that hasn't worked for me yet... - but from bulbs. Another source of bulbs can be the California Native Plant Society chapter plant sales - many of which are in the spring. Google "CNPS" for your local chapter website. The CNPS chapters are a great source of native 'bulbs'. They often have local species and types not available from any other source. An added benefit is you may meet other local 'bulb fanciers' who are local experts on growing these native gems.